Nearly every appraiser of warehousing quality agrees that the most critical element in a successful operation is the people. While quality in management and supervision is critical, the quality of every hourly worker is important. When I was CEO of a multicity warehousing organization, I constantly reminded our key people that our company could never be better than its worst manager. The battle for talent is more intense today than it has been for many years. In a tight labor market, a significant number of these people who are searching for jobs are poor risks. The number of job hunters with substance abuse problems may be as high as 50 percent, not because the abuse problem is further out of control, but simply because most of the drug-free people are employed already. Searching out and screening job applicants to hire only the best is a difficult task for any manager. However, it becomes even more difficult when an operations manager is leading the search. 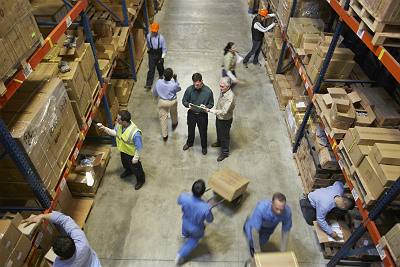 In most warehousing companies, the search for staff is stimulated after the work load exceeds capacity to handle it. A manager who is already under pressure to handle the daily volume is more likely to make bad decisions in choosing new people. It is common to find people problems at any warehouse that is forced to "ramp up" quickly. For this reason, it is sensible to have the recruiting, interviewing and primary selection process handled by human resources specialists, or another manager who is not under direct pressure. The process will vary, depending on the positions to be filled. The procedure for recruiting a general manager will be different from that of recruiting additional lift truck operators. Selecting qualified staff is not a scientific process, and anyone who claims to have a foolproof method for eliminating recruiting errors either is wildly optimistic or dishonest. At the same time, there are tools that will enable you to improve the odds in your selection process. For example, Web-enabled testing provides remote execution combined with centralized administration of the test. This allows the screening process to be completed at a lower cost, without sacrificing quality. Many people are unaware of the existence of such tools. How do we define "great" people? Attitude is the most important attribute. Job knowledge can be acquired by any intelligent person. Attitude is ingrained from early childhood, and is difficult to change. Honesty is equally critical. Unfortunately, today we cannot assume that any individual is honest. Work ethic is related closely to attitude. While productive work habits are common throughout much of the U.S., it is not the situation within every culture. Additionally, as experienced by the auto industry, unproductive practices that are tolerated by unions and management, can impede competitiveness in a world market. Another quality measure is health and wellness. A healthy worker is free of substance abuse and tobacco and emphasizes good health habits and physical fitness. Use assessment tools and/or interviews to determine attitudes and competencies. Do not neglect drug tests. Great employees come from great employees. Establish rewards for successful referrals. Be sure you provide a realistic view of the job. Learn about businesses that are closing or opening in your neighborhood. Communicate with employment service offices. Maintain more than one source. Check the credentials and success record of each supplier. Try to screen in, not screen out. When the labor market is tight, the best companies should attract attention. How do you minimize your chance of making bad decisions in picking people? In both large and small firms, the use of outside resources can be both a way to save time, and to improve selection accuracy. Know why you are testing. A test that is not aligned with the job is worse than no test at all. Don't design your own tests. Work with a reliable provider having statistically valid products. Check on the success of your testing program by correlating it with hiring results. The U.S. Department of Labor has published standards for evaluating employment testing. The name of the test and publication date should be checked. Be careful not to confuse tests that have similar names, and be sure that you have the most recent version. Check the qualifications of the test authors, and the format of the test. Consider the administration time. How long does it take to complete the test, and how long to grade it? Gather information on the reliability of the test. Validity is even more important than reliability. Does the test measure what it is supposed to measure? How long has the test been used, and what is its history? Does the test comply with federal civil rights and equal opportunity legislation? Are there multiple objective studies showing the test to be an accurate predictor of future job performance? Has the vendor ever been the subject of a lawsuit? What is the experience and the qualification of the person who will interpret the test results? Industrial psychologists provide support in the hiring process. The full-service approach includes both testing and personal interviews by the psychologist. Because of their critical nature, you may want to choose the full-service approach when filling your most senior positions. A Web-based testing solution may be sufficient when screening potential truck drivers or forklift operators. Today's information technology provides more options for employers. Online job testing is now more useful and reliable than ever before. However, one factor remains constant: In creating a great warehousing organization, the process starts by choosing, then retaining, superior people.